This is an Advanced Readers Copy I received from LibraryThing… I really wanted to see 'family history' book of a famous family. 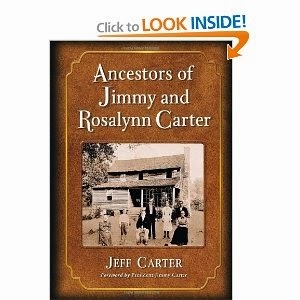 I had read several of Jimmy Carter books, but not the details of his genealogy/family history. During his presidency, Jimmy Carter received a comprehensive analysis of his family's genealogy, dating back 12 generations, from leaders of the Mormon Church. More recently Carter's son Jeff took over the family history, determined to discover all that he could about his ancestors. This resulting volume traces back to the original immigrants to America and chronicles their origins, occupations, and life dates. Among his forebears Carter found cabinet makers, farmers, preachers, illegitimate children, slave owners, indentured servants, a former Hessian soldier who fought against Napoleon, and even a spy for General George Washington at Valley Forge. With never-before-published historic photographs and a foreword by President Jimmy Carter, this is the definitive saga of a remarkable American family. The son of President Jimmy Carter and Rosalynn Carter, Jeff Carter is a researcher for the Conflict Resolution Program at the Carter Center at Emory University in Atlanta, Georgia.